Where have all the sustainable tuna gone, long time passing? Where have all the sustainable tuna gone, long time ago? You have eaten them everyone. Actually, it’s not entirely true. You have eaten them, surely. But actually, you have been eating mostly unsustainable tuna for a long time. So while there may still be some sustainable tuna out there to eat, likely it doesn’t find its way to your plate too often. We will explore why that is here. In late October, Greenpeace and Hugh Fearnley-Wittingstall (for the non-UK crowd, read about him here) launched an art installation to protest tuna importer John West and its parent company Thai Union. In 2011, John West committed to sourcing 100% of its tuna from sustainable sources by 2016. When they stay sustainable, John West was referring to sourcing from pole and line fisheries and from free-school fisheries. Greenpeace reports that they have only sourced about 2% of their tuna sustainably, leaving a whopping 98% to address in the next year. Additionally, and perhaps of more importance in my opinion, Thai Union was implicated in a New York Times exposé on slavery at sea, and thus the art installation calls out John West on this issue as well. This naming and shaming is a form of market-based governance, a growing approach to promote environmental sustainability through use of the market as a governing institution that incentivizes behaviour outside of traditional government interventions. A little about pole and line fishing: it dates back hundreds of years. 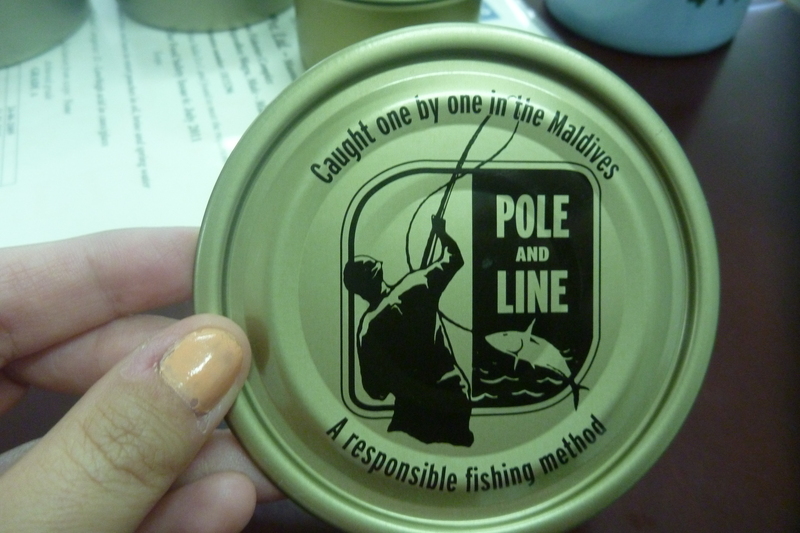 A fairly recent NGO, the International Pole and Line Foundation, highlights the mantra One hook, One man, One fish. Check out some youtube videos of the fishery in action, it is amazing to watch. Unbaited hooks on long fiberglass or bamboo rods are used to bring in skipjack tuna, while some of the crew throw bait off the sides of the boat, a practice called chumming. Chumming brings skipjack tuna to the surface and they are easily snared and flung aboard. The Maldives, Solomon Islands, Indonesia and Japan all have sizeable pole and line fisheries. The Maldives fishery obtained certification by the Marine Stewardship Council (MSC) in 2012, arguably the biggest name in the seafood eco-labeling game. The sustainability gains for pole and line fishing are purported to be ecological (due to a selective fishery with zero non-target catch, and the reason for MSC certification) and social (due to high amounts of labour required). Personally, I agree with the latter and think the jury is still out on the former. and oranges because each study may be using the term “bycatch” to mean a different thing.” But NGOs communicating about sustainability, and requiring sustainable sourcing commitments from their partners, need to be transparent and realistic about what sustainability gains are in fact reachable. But I digress. This post is about John West sourcing sustainably from pole and line and free-school fisheries. What about that second part then, what are free-school fisheries? Most of the global tuna catch (about 60%) comes from the purse seine fishery, whereby a large net is cast around a school of tuna, closed at the bottom, and the school slowly hauled in to be offloaded onto a boat. Purse seine boats have a couple of choices when they do this. They can either set their net around a school that is associated with a floating object (which can be anything from a drifting log to a large man-made structure called a fish aggregating device or FAD), or they can set it on a free-school. About 65% of the total global purse seine catch was made on floating objects in 2014. So what? Floating objects attract schools of tropical tuna, as well as other fish and marine life like rainbow runners, dolphinfish (a fish, not a dolphin…), sharks and rays, and sea turtles. PEW Charitable Trusts has a short video of how FAD fishing works. FAD fishing is thought to be a less-sustainable form of tuna fishing than free-school fishing and pole and line fishing because of the high catch of non-target species, and is specifically villanized for its catch of immature yellowfin and bigeye tuna (although as we just read, pole and line also catches immature yellowfin). Notably, if we combine the numbers above, purse seine fisheries setting on FADs make up 40% of all tuna caught, traded and consumed. Additional to that is the fact that pole and line and handline fisheries also catch fish on FADs, so demonizing FADs is a blanket way of demonizing the majority of tuna catches worldwide. The point of all is this is just that expecting to have your sustainable tuna and eat it too might not be possible. There just isn’t enough sustainable tuna on the market. And actually, it might be disingenuous of NGOs to name and shame companies into making sustainable sourcing commitments that they will absolutely never be able to keep. Rather it needs to be a conversation. Do you want to sell (insert eat here if you are a consumer) tuna? If so, you have choices. You can commit to sourcing only sustainable tuna (but I’m still not convinced what that is…) and drop your supply by half. Or you can acknowledge, as John West has been forced to do here, that in fact the methods by which you wanted to source will not allow you to meet the demand that you have for tuna, and you need to make a revised and more credible sourcing commitment. For starters, how about committing to slave-free tuna, also demanded of John West by Greenpeace? That commitment ought to be easy to meet, right? Actually, not likely, but more on that in a future post. In the meantime, it’s time for consumers, civil society and the seafood industry to (wo)man up. Sourcing and eating only sustainable seafood is hard. It can be done, but it will require sacrifice and putting your money where your mouth is. Statistically speaking, the fish and seafood you eat is probably not sustainable, because the majority of the world’s fisheries are not managed in a sustainable way, are not operating on healthy stocks, do not employ labour rights or standards in their operations, and are not transparent in communicating practices to regulators and consumers. Sustainability means having fish in the future oceans and having fish harvesters exploiting said fish. If honest conversations and transparent credible commitments are not forthcoming, the next song we sing won’t just be about the missing sustainable fish, but the missing fish harvester too. Where have all the fish harvesters gone, long time passing? Posted on November 12, 2015 November 12, 2015 by meganbaileymapPosted in Fisheries, Food Policy, Global Food Governance, SolutionsTagged bad news, civil society, Food Policy. Yup, good article Megan​, thanks for explaining the issues clearly. Completely agree about the need for a conversation. Have also observed that making that conversation meaningful requires all sorts of incentives upon participants. Unfortunately human nature responds to $, fear, love or pride…..so although I know anti-campaigns are a struggle for all involved, they’re sadly necessary. I also acknowledge the statistical and semantic games when it comes to defining bycatch. I would guess that the FAD based bycatch in pole and line fisheries is vastly less than industrial purse-seining. Lastly, are you going to highlight in a subsequent post why market governance is so crucial, because government governance is so deplorably poor? Katherine yes – a subsequent post is a great idea! I think as a percentage the proportion of bycatch in both fisheries is not statistically different. But it’s the relative volume that that percentage is being computed against. As in above, 10% of 3 million tonnes is 6 times as much bycatch as 10% of 500,000 tonnes. Any trips to North America in the future (or more explicitly, the east coast!)? Surely there are a number of moral hazards for NGOs moving away from formal governance and attempting to accomplish their aims through market governance. You move into the smoke and mirrors world of marketing where misinformation is paramount. Ad men have no integrity, NGOs without integrity are fatally compromised. You also concede that Europe and the US etc. should have one approach (capitalism constrained by regulations) while the rest of the World should have another inferior approach (capitalism constrained by capitalism (or more accurately western consumer preference)). Moral hazards abound in the natural resource management realm. I don’t agree that it’s necessarily NGOs that lack integrity that are the problem. Lots of great NGOs steer the conversation in the wrong direction but not out of shady ethics. Capitalism should be constrained by regulation in many ways (IMHO), but I think that market based governance should be seen as complimentary to state governance. Neither need constrain the other, but rather they should mutually reinforce each other. And I definitely concede that the way the market has been used in the sustainable seafood movement is to prioritize neoliberal values and western ideals about sustainability and impose these on a global scale without any cultural sensitivity to the needs and wants of the majority of the world’s seafood-producing nations. Thanks for the reply Megan. We’re very much on the same page MG = ‘complimentary to state governance’ while effective governance = gold standard. Best, Phil. 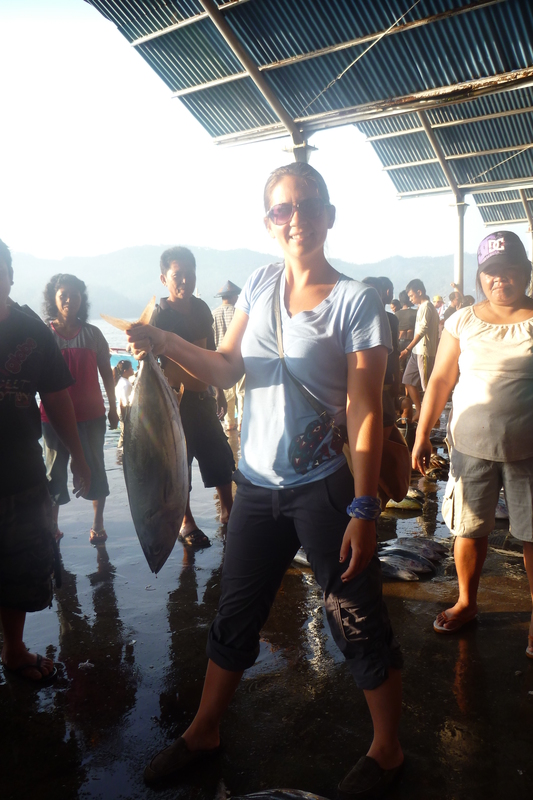 Thanks for the interesting thoughts on sustainability of tuna fishing. To an outsider like me your blog seems to show that even advocates of sustainability risk and loosing sight of the big picture. Thus, conversation is important. Yes, but that’s also somewhat unsatisfactory. So there isn’t yet a way I can satisfy my appetite for tuna sustainably? Could it be that a discussion about fishing methods by definition cannot answer the question of sustainability of fishing stocks? To many line fishermen can still deplete stocks, can’t they? So the main issue seems to me not the fishing method but the condition of stocks and ecosystems. Is it at all possible to manage this with market based governance? Hi Freek. Thanks for your thoughts. You are absolutely right. If there is 10% bycatch in the pole and line fishery and 10% in the FADs fishery what makes the FADs fishery worse? In this case, that 10% is of 3 million tonnes and not of 500,000 tonnes. Fishing methods in and of themselves are not necessarily sustainable or unsustainable. One FAD fishery the world over would not an unsustainable tuna fishery make. Scale scale scale. The condition of the stocks and ecosystems is certainly important. But no matter where we are in stock status now, if we fish too much we will end up at a worse place. So it’s both the state of the stock and the pressure currently driving that stock down, which is a function of the fishing method. And I personally do not think it is possible to manage it all with the market. Nation states are the legal stewards of fisheries resources found within their exclusive economic zones (200 nautical miles). They act as stewards for us, the citizens. So every individual has a right to demand certain measures of their governments in order to manage sustainably. This right should be acted upon and governments should be held accountable for the fish they exploit and the fish they import.